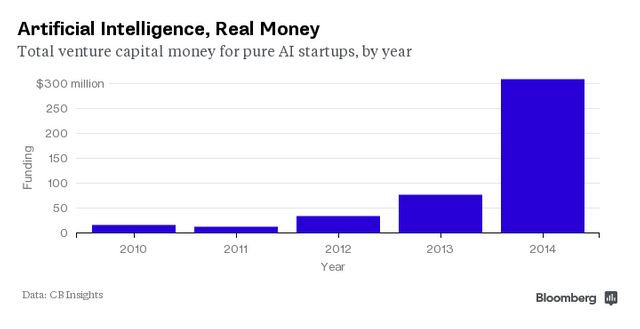 Sophisticated quant funds have been deploying AI and its subset, machine learning, for years. Now data shops are leveraging the power of cloud computing to help hedge funds and other FIs run complex, big-data computer models. Five years ago digesting these massive data sets would have required months of coding and $1 million-plus of hardware. With Amazon Web Services and other cloud service providers the game has changed. It sounds like the mother of all spreadsheets: 1 million rows, 1 million columns -- 1 trillion entries in all. Fortunately, Braxton McKee isn’t using Excel. Instead, he’s tapping into the cloud to crunch all that market data on the cheap with software he built that learns as it goes. The cost of that cosmic power: $10. Welcome to the brave new world of cheap-and-cheerful artificial intelligence. McKee, 35, is part of a wave of math and computer whizzes that’s pushing data science to new heights across Wall Street. What’s remarkable about their efforts isn’t that AI science fiction is suddenly becoming AI science fact (sorry, Steven Spielberg). It’s something more mundane: thanks to cloud computing, mind-blowing data analysis is getting so cheap that many businesses can easily afford it.